The number of returning adults is an important metric in coho salmon recovery, as these fish are the basis of future wild coho populations. NOAA Fisheries has established a recovery target of 10,100 adult coho salmon returning each winter to the Russian River basin. Seen a floy-tagged steelhead? #knowyourcoho Just for fun: Test your adult salmonid ID skills! The Russian River adult coho count is up to 310 returning adults, as of January 22. Although it is not turning out to be one of our highest return years, it is looking like one of the best in terms of 3-year old fish and spawning activity. Unlike last year, where we estimated that only 4% of the returning adults were 3-year olds, this year we estimate that 85% are 3-year olds. Not suprisingly, this has meant more coho redds in the streams. Our count as of 1/29 is 72 redds, which is approaching our record of 75 in 2016/17. Steelhead spawning activity is picking up with 84 redds and a lot of live fish observations during the past couple of weeks. We anticipate that this next storm will bring in even more fish and it will be exciting to see what we find in some of the new reaches in the upper watershed. This was the first winter that the Russian River CMP program surveyed steelhead habitat in the upper Russian River watershed. Sonoma Water and Sea Grant crews surveyed 48 streams and observed a total of 228 redds (Chinook, steelhead or unknown salmonid species), most of which were steelhead species. 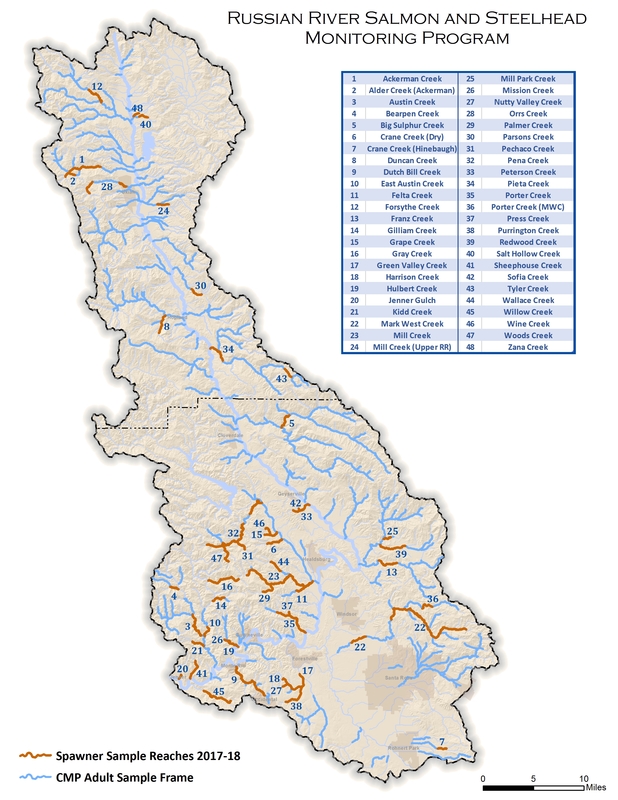 The estimated total number of adult coho salmon returning to the Russian River Basin was 763, based on PIT-tag data. This is the highest estimate since the inception of the Broodstock Program; however, the vast majority of these fish (97%) were 2-year old jacks and there was a dissportionately high number of males, so numbers alone don't tell the whole story. Summer 2018 juvenile counts will be more indicative of spawning success. See our Winter Monitoring Report for full details on adult sampling methods and outcomes. Estimated annual adult hatchery coho salmon returns to the Russian River. Methods were not consistent among years; prior to 2009/10, spawner surveys were the primary method, from 2009/10 – 2011/12 methods included spawner surveys, video monitoring and PIT tag detection systems, and beginning in 2012/13, with the installation of the Duncans Mills antenna array, PIT tag detection systems were the primary method used.